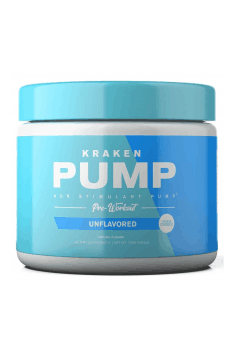 Sparta Nutrition Kraken Pump is a multi-ingredient pre-workout supplement containing an advanced complex of ingredients (HydroMaxTM, Alpha-GPC, Vaso-6TM, and pine bark extract) with a synergistic effect on the increase of the muscle pump. It also provides excellent concentration during training, without the addition of stimulants. The preparation enables training at a higher level, without causing too high stimulation or problems with falling asleep. HydroMaxTM – it is a patented form of glycerol, characterized by high stability and an almost threefold higher concentration than the classic glycerol monostearate. It causes greater retention of fluids in muscle cells, which results in their greater swelling, faster post-workout regeneration and the improvement of exercise capacity. The greater amount of water in the cells the more intense of the performance of anabolic processes and increased inflow of energy substances (e.g. glucose) to the cell. Glycerol itself is able to improve the transport of oxygen, nutrients or anabolic hormones to the muscles, promoting better performance during training and faster recovery after its completion. It can also improve the glycogen recovery after training. Alpha-GPC – it is alpha-glyceryl-phosphorylcholine, i.e. choline with the highest bioavailability and the ability to cross the blood-brain barrier. It is used for the production of acetylcholine (ACh) – the main stimulant neurotransmitter, responsible for receiving stimuli and muscle fiber contraction. As a result of choline supplementation in the form of Alpha-GPC, a person performing strength training is able to better control muscle contraction, thereby activating a larger part of the fibers, which in turn gives an incentive to the growth of muscle tissue. Elevated levels of acetylcholine in the brain that result from taking Alpha-GPC, causes a significant improvement in cognitive function and concentration. Studies also showed an increased burst of growth hormone due to pre-workout supplementation of this form of choline. Moreover, some studies also indicate an increase in the output power immediately after Alpha-GPC ingestion. Vaso-6TM – it is a patented ingredient that stimulates the secretion of nitric oxide, isolated from the extract of green tea and grape seeds. Studies confirm that up to 20 times lower dose of Vaso-6TM compared to the popular arginine in pre-workout supplements increases vasodilatation up to 10 times more! Vaso-6TM has a strong effect that promotes the relaxation of blood vessels so that even more blood flows into the muscle tissue. Consequently, muscle cells have access to a large amount of nutrients, which results in the sensation of a powerful muscle pump, the effect of "swelling" muscles and increased efficiency during strength training and a much faster regeneration process. Finally, this phenomenon increases the synthesis of muscle proteins by improving muscle nutrition and a greater load during a workout. Pine bark extract is known for its properties to improve the functioning of the blood vessel endothelium. In addition, it has anti-inflammatory and mild analgesic properties, it may also increase aerobic capacity and strength in athletes. It contains as much as 95% of proanthocyanidins, groups of about 50 compounds with numerous pro-health effects. Proanthocyanidins have above all a powerful antioxidant potential, thanks to which they eliminate inflammation. In addition, they have a positive effect on the circulatory system – they improve the circulation and elasticity of the vessels. Pine bark extract, by improving the endothelial function of the blood vessel, increases the availability of nitric oxide, which results in the vasodilation of blood vessels. Thus, it causes rises blood flow through the muscle tissue, elevates the feeling of a muscle pump and provides benefits such as increased strength, better nutrition and oxygenation of muscle tissue, and faster regeneration. In conclusion, Sparta Nutrition Kraken Pump is a pre-workout preparation with a well-thought, synergistically selected composition that promotes an amazing muscle pump that lasts long after the workout. It is an excellent supplement for all people who are too sensitive to using pre-workout based on stimulants, or who train late in the evening and have problems falling asleep following the ingestion of stimulating supplements. Gum Acacia, Natural and Artificial Flavors, Gum Blend (Cellulose Gum, Xanthan Gum, Carrageenan), Citric Acid, Acesulfame Potassium, Sucralose, Silicon Dioxide, Calcium Silicate.